Senator says homeowners should be able to sue for allegedly shoddy work. Under Donald Trump's administration, the already uphill battle new homeowners say they face when taking on builders over allegedly shoddy and unacceptable work could become even steeper. "You know a lot of the problems that you have are judicial, lawsuits. 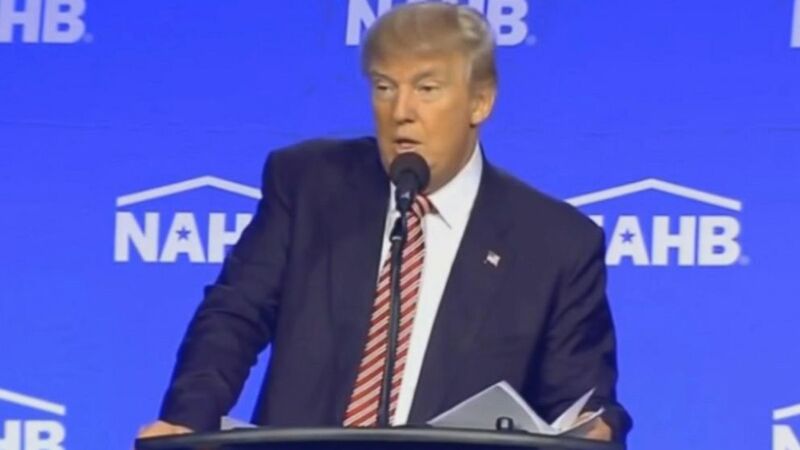 I know the problems that you have," Trump told the National Association of Home Builders in August. "You build a beautiful house, and sometimes you make mistakes, OK? And sometimes you build a lousy house, OK? And they should sue you. But I know the people, many of the people in this room, you're professionals. You build great products. You have a tremendous problem with the court system ... So we're going to make sure that, you know, that a lot of the things that are happening to you just can't happen." Trump, who also said that construction regulations for homebuilders are "horrible," spoke as some homeowners across the country say they are struggling with major homebuilders to fix big problems in brand new homes, as an ABC News "Nightline" investigation found. (ABC News) As part of a "Nightline" investigation, ABC News' Brian Ross speaks with homeowners who say they discovered serious problems in their new homes. In that speech, Trump asked members of the audience to raise their hands if they have been involved in any "frivolous" lawsuits. Few did, apparently, because Trump then said, "That's all? Not that many. Seriously? They're just embarrassed to raise their hands." But it also might be because — counter to Trump's suggestion that homeowners should be able to sue if the construction is shoddy — oftentimes homeowners are pushed to sign contracts with the builders that bar them from filing lawsuits. Instead, they're forced into third-party arbitration, which may not be appealed and is often kept confidential. Then-candidate Trump speaks to home builders in Miami, Florida in August 2016. Vickie Pynchon, an attorney who served for years as an arbitrator in construction defect cases, said that the system is advantageous to the homebuilders, who help keep the arbitrators in business. "[Homebuilders] like arbitration because it favors them," Pynchon told ABC News. "The secret deck is stacked against the homeowner." After the "Nightline" investigation into the challenges homeowners face when trying to fix allegedly poorly constructed houses, Sen. Al Franken, D-Minn., a longtime critic of mandatory arbitration in other areas, said the laws should make things easier, not harder, for homeowners. "When you're wronged in America, you should be able to seek justice through the legal system. But because of mandatory forced arbitration, little clauses buried in the fine print of contracts that you and I sign all the time, Americans are unknowingly signing away their rights," he said. "Now it's disturbing to see that these unfair agreements are reportedly being used by some large homebuilders to ice out homeowners who have been wronged." One recent court case could signal a big change in favor of home buyers. In South Carolina, the state Supreme Court ruled in July that a mandatory arbitration clause in a homebuilder's contract was "unconscionable" and "unenforceable," allowing members of a local family to proceed with suing their builder in court over problems with their home. An attorney for the family, Philip Segui, said prospective homeowners often don't realize what they're getting into when mandatory arbitration is part of the contract they sign. "They're almost always very surprised when we have that conversation that we're going to have to potentially go to arbitration," he said. "We have to explain it to them that their constitutional right to a jury has been waived and there's not going to be 12 people that may be able to relate to their situation making the decision anymore. It's going to be some preselected third person that we hope will make the right decision." However, homebuilders, along with the American Arbitration Association (AAA), maintain that arbitration is a fair and efficient way for homebuilders and homeowners to come to a relatively speedy solution without further clogging America's overburdened court system. "Like all Americans, I'm concerned with the increase in litigation," said Jerry Howard, the CEO of the National Association of Home Builders. "I think that, in the end, arbitration is more efficient and more cost effective for everybody." The AAA said in a statement to ABC News that its statistics say fewer than half of arbitration cases proceed to an award before they're otherwise settled and when they go to an award, the homeowners are identified as the "prevailing party" a little more than half the time. So many disputes arise, Howard said, in part because homeowners' expectations can be too high. "I think the American consumer expects a perfect home. There's no such thing as a perfect home, and so I think that there are often disputes that arise out of that," he said. Howard said he believes American homes that are being built now are "up to the standards that they are held to legally and beyond that." As for the perfect president, Howard said his group was just looking for a candidate who is "pro-housing." "We want candidates who recognize the importance [of] the housing sector and the homebuilding sector ... both in the economics of the United States but also in the social fabric of the country," he said. "And we judge candidates not according to their partisan stripe but whether or not they are housers." ABC News' Kalyn Wilson and Lizzie Yang contributed to this report. 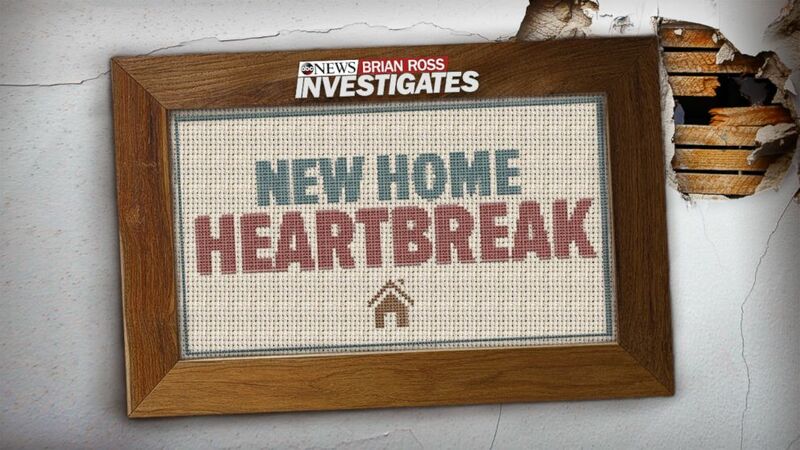 (ABC News) New Home Heartbreak, an investigation by the ABC News Brian Ross Investigative Unit and "Nightline."